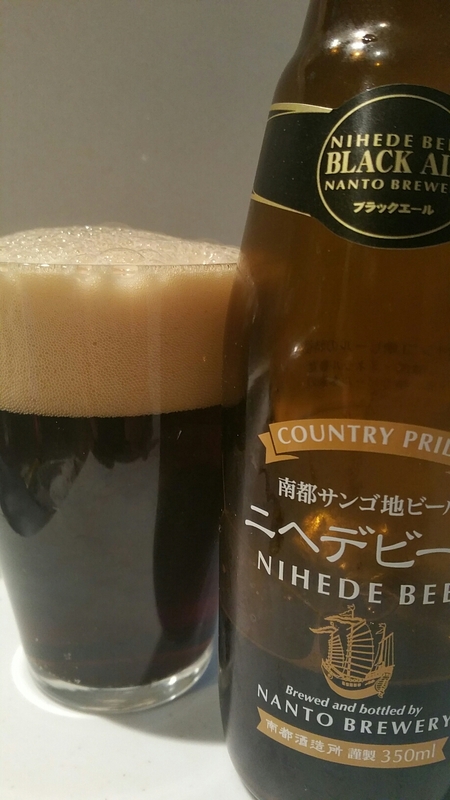 Nihede Black Ale is a 5% porter style beer from Okinawa, brewed by Nanto Brewery. It is an unfiltered beer, allowing the yeast to actively condition the beer until the moment it is drunk from the bottle or keg. Nihede Black Ale is styled as an original Okinawan black ale to fit in with the idea of being an Okinawa product. It may be categorised as a porter but it doesn’t look like one. First things first, Nihede Black Ale was a gift from a friend that we *almost* left behind at a Minoh event at Gold’n Bub due to too many Minoh Imperial Stouts. They just hit hard and made me lose pretty much all my sensory functions. So losing a free beer would have been a pretty bad and irresponsible thing for me to do though luckily the kind staff there pointed out my transgression and sent me on my way into the night with the beers in tact. Nihede Black Ale is styled as porter beer though on the initial pour, I was taken quite aback. It didn’t *look* like a porter – lively and frothy, with a frothy off-white head that fizzled and bubbled away to leave an oily coating on top. The aroma was more porter than the body though, with some hints of roasted chocolate malts along with a dash of smoky coal in there too. The body was far to thin for my liking however and Nihede Black Ale came across as a diluted schwarzbier that had some extra malts thrown in hoping that something stronger would develop during the bottle conditioning process. There was a strong taste of what would later be identified as brown sugar, a popular local product sourced from Okinawa that left my teeth tingling and screaming to be brushed. Nihede Black Ale’s aftertaste was bland, with the merest hint of flavour indicating that I had drunk it. Nihede Black Ale is a disappointing beer considering it’s styling itself as an original, and unique, product. Nihede Black Ale an be bought from the Nanto Brewery 0nline store here as part of a six-pack. It can also be bought from World Beer Market here.